Celebrating Mom. Celebrating Mom's Food. Per Wiki a canapé is a type of hors d’œuvre, a small, prepared and usually decorative food, held in the fingers and often eaten in one bite. The name comes from the French word for “couch”, drawing on the analogy that the garnish sits atop the bread as people do a couch. So let’s read between the lines – you eat these canapés with your fingers while sitting on the couch? Oui, oui, parfait – yes, yes, perfect! I’m in! Snap, snap – let’s get to this recipe (pun intended)! ❤ Canned crab? Yeah, all I can say is “it was the 1970s.” A time before everything farm-to-fork fresh was expected. The 70s were a time when speed to market (or in this case speed to belly) was key. There’s no doubt my parents loved fresh seafood because we spent many summers crabbin’ and fishin’ at the Texas Coast. 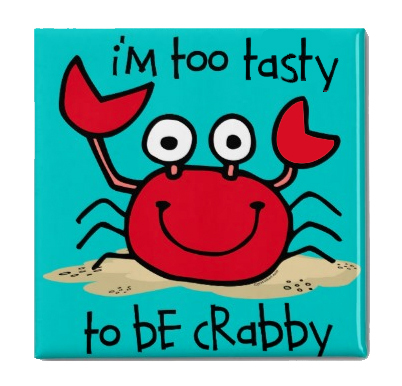 See the crabby pic below! ❤ I had a difficult time finding the Old English Sharp Cheddar Cheese Spread (below). I discovered after some online research that it’s hard to find in stores but you can order it from the folks at Amazon.com. I found its kissin’ cousin – Kaukauna Spreadable Cheese from Wisconsin at my local HEB. Hint: After scouring the aisles for the creamy cheese stuff I finally found it in the refrigerated section by the deli. ❤ I like these canapés broiled until just a little toasted black develops here and there. 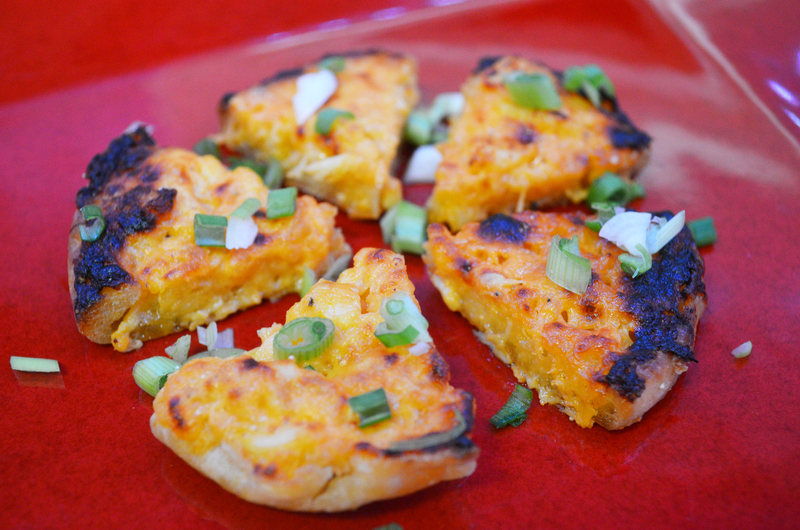 The result was a crispy, bubbly texture that complimented the nook and crannies with the cheese and crab mixture. ❤ You don’t have to broil these all at once. In fact there wasn’t a way for my pan to hold 12 prepared english muffins halves *and* fit in my freezer. We prepared these in two batches and you’ll find these are best enjoyed warm, which works out perfectly for entertaining. 1. 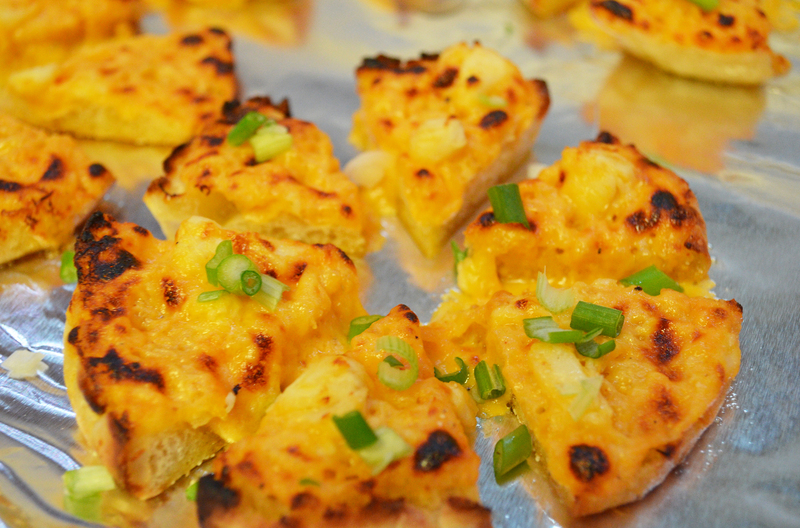 Let the butter (or oleo) and cheese spread soften to room temperature – about 30 minutes or more. 2. Mix the butter and cheese spread together with the mayonnaise, garlic salt and seasoned salt until creamy. Gently fold-in the crabmeat (or shrimp) and combine. 3. 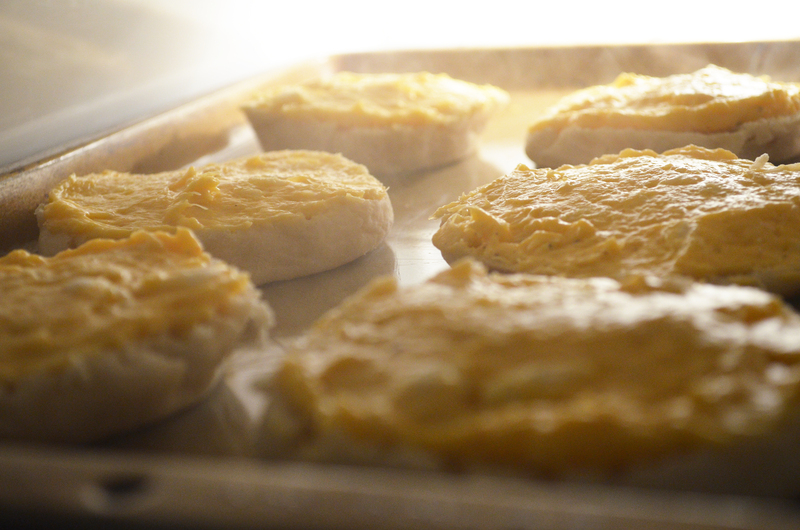 Spread the crab mixture on the split English muffins and place them on a cookie sheet that will fit into your freezer. Freeze for about 10 minutes so the crab mixture sets well. 4. After chilling, cut the muffins into ⅙-ths. You can broil them now or freeze them for later use. If freezing, I inserted a piece of wax paper between laters to prevent the crab mixture from sticking together. 5. 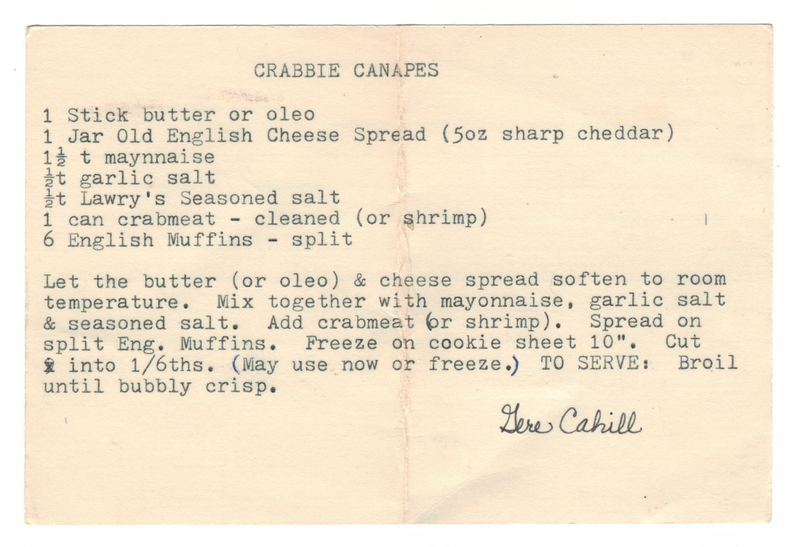 To Serve: broil the crabbie canapes until they are bubbly crisp. You can garnish with some sliced green onions, which I thought added a tasty texture. I hope you enjoy this recipe! Here’s a scan of the original recipe from Mom’s cookbook – she received it from a family friend named Gere Cahill who lived down the street in the La Fiesta Apartments. I remember Gere always dropped off Christmas presents for us every Christmas Day and he had me over to swim a few times, which was tons of fun. His gifts live on thanks to this recipe. 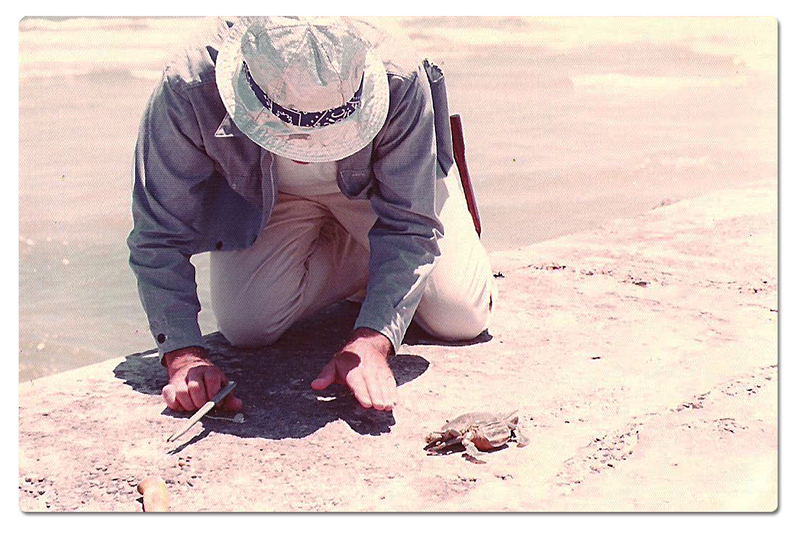 My Dad hypnotizing a live crab at the Texas Coast, July 1975. Follow our sister site "Home Style Austin" for the best inspiration for food, design and landscape living!